Every business that desires to be successful is concerned with formulating the right content marketing plan. How will I create the content I need? What website adjustments must I make? What social media channels will I focus on to connect with my audience? How often will I post content to each platform? These are legitimate questions to be asked and answered; but what should come first? With 91% of B2B companies employing content marketing, developing a guiding strategy is paramount. How can any business construct a viable content marketing plan without first formulating a content marketing strategy? A plan is a systematic, detailed set of actions to be carried out in order to achieve a desired set of goals. A strategy outlines an overarching purpose that guides and defines all our business plans. A content marketing strategy, therefore, is the primary statement of purpose from which our content marketing plans are made. Where do we obtain such a strategy? What should we include? Let’s examine each of these three aspects of a content marketing strategy that will have an impact. If you already have content published, evaluate what you already have. There are many types of content you can use. A successful strategy isn’t about using as many as possible, but rather determining which are the most relevant for your company and your audience. What will meet needs, elicit interaction, and move people along toward becoming customers? What specific types of content will appeal to your target audience or audiences? You may not find all these types of content relevant for your business or audience, but don’t be afraid to experiment with a few new ones. Whatever your content priorities, it’s better to invest more effort and resources into two or three types of content than to become overwhelmed with social media channels, newsletters, a daily blog post, and an ambitious video schedule. Focus on being consistent with what you choose to do, and do it well. The goal is to create high-quality content that provides value to your audience on a regular schedule. What goals do they have and how can you help them achieve those goals? What social media channels are they most likely to engage with? What are their preferences, related to your products and/or services? What about age, education level, and income level? Are these factors relevant? Whether your business is mainly engaged in B2B or B2C, creating a full buyer picture is one of the most challenging steps in crafting a good strategy. Use customer feedback surveys, social activity, focus groups, and more to discover how your audience thinks and behaves. Talk to your customers and ask them questions about what they bought from you, and why. Review these buyer personas at least once a year. Refine them to keep an accurate view of the type of people at which you should aim your marketing efforts. Knowing how these people operate will significantly change how you create content for them, and can even drive product or service developments. Is all that time in research and refining personas really necessary? Your overriding goal with all these efforts at researching buyer personas and creating specific content targeted at the ideal buyer is to drive profitable customer actions. Selling your products and services is ultimately what keeps you in business. Any content marketing strategy that doesn’t have that as its ultimate goal is misguided and worthless. Attractive and engaging content that connects well with an audience and provides value will be remembered, used, shared, and ultimately, will bring customers to your website to buy products or book services. It’s that simple…in concept. Your strategy will no doubt follow this basic format, but will grow as you seek to engage greater audiences. Then, your content marketing plan will develop the details of what is created, when, how and when it is shared, and how its effectiveness is measured. 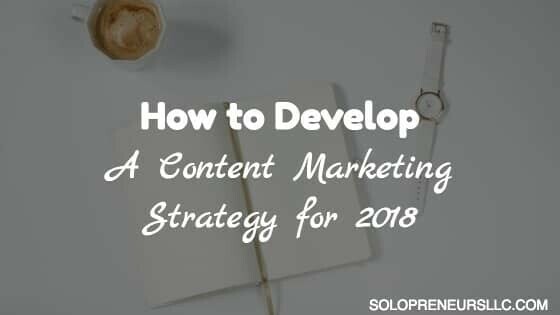 Have you defined a content marketing strategy for 2018 that drives your marketing plans? How did you come up with it? Does it seem to be working? What, if any, changes have you already made? Share your wisdom and tips with our readers in the comments below.